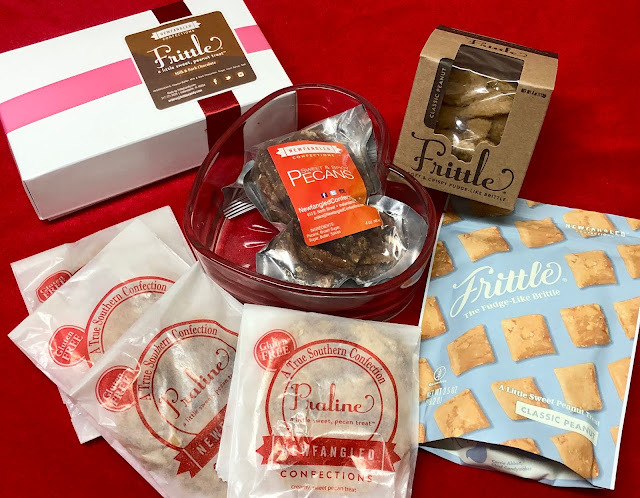 The fine folks over at Newfangled Confections sent me a wonderful assortment of their sweets to try out and share with my family. And after a few days of taste testing I'm here to share with you that it was a 100% unanimous vote that we LOVE everything from Newfangled Confections. I sent one of their Southern Pralines with my husband in his work lunch and he actually stopped and called to tell me "that cookie was amazing". Yeah they are that good. As is everything else in their line including their signature Frittle confections. What is Frittle you ask? Frittle blends the classic peanut-buttery sweetness of brittle with the creaminess of peanut butter fudge. The melt in your mouth, bite-size squares deliver a perfect one-two punch of crunchy, flaky peanutty bliss that will leave you craving more! Add some chocolate coating and they are twice the treat! Also available are their Sweet & Spicy Pecans - another favorite of my everything spice loving husband. Frittle is available regionally at Target, Kroger, Fresh Thyme and nationally at The Fresh Market, Beall’s, Raley’s, Books-Million as well as high-end shops and markets. They are also online at Newfangled Confections PLUS soon to be available on Amazon. Speaking of favorite sweets. 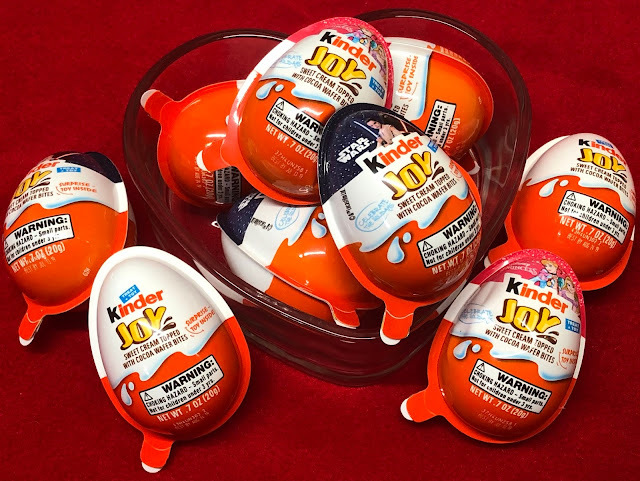 Kinder Joy eggs are one of my daughter's favorites not just at Valentine's but at every holiday. I'm not sure which part she likes more the crispy creamy confection on one side or the collectible surprise toy on the other. She's a big fan of both sweets and surprise treats. And Kinder Joy eggs bring her both! For under $2, kids can enjoy a delicious treat and discover a surprise toy including balls, racing cars, animals and special licensed toys from Disney Princesses and Star Wars. One half of the egg contains two layers of milky sweet creams topped with 2 crispy wafer bites filled with cocoa cream. The other half of the egg contains an exciting surprise toy to spark kids’ imaginations and bring them hours of fun. These look really good. I hadn't heard of Frittle, but I'll be trying that!